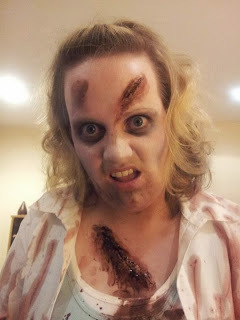 Last year I went with a classic, Zombie! You just need to have a little time and patience with some theatre wax and a lot of fake blood (plenty of old clothes too of course). White face makeup is another essential. One great part about this look is, you can't really go too wrong, you are supposed to look a mess and you don't even need to worry about your hair, let it dry naturally and you're done. 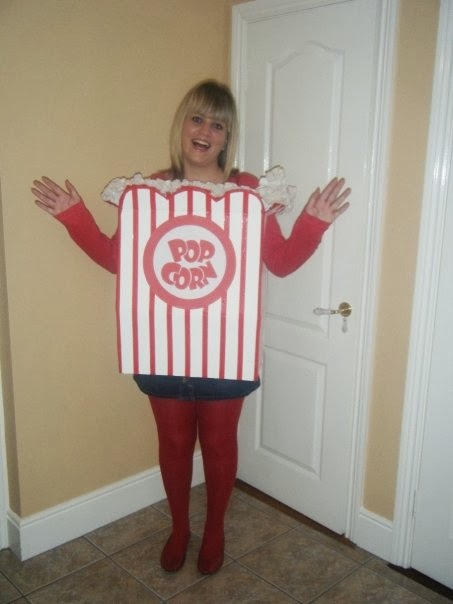 The previous year I was as a box of cinema popcorn. Definitely much less frightening. For this your main equipment includes a cardboard box, white paper, red paint, glue, lots of cut up pillow cases. The box part is relatively straight forward, you just need to cut it to shape, paint it and stick it all together. Then for the popcorn around the top, cut up old pillow cases and staple in individual chunks, which you then attach to a sheet which will travel around the inside of the box (glue/stitch it to the box). Then put some straps inside the box and hey presto, you're off! What are you thinking of going as?